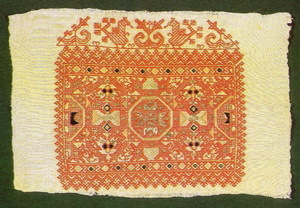 Embroidery >>> Ancient Embroidery Photos >>> The Sun. an ethnographic expedition to Karelia, 1939. 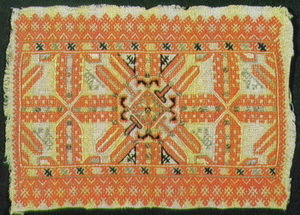 Main pattern is a solar wheel with "Trees of Life" in corners. Upper frieze : minor solar rosettes, down frieze : "Trees of Life" separated by "sun birds". The major all-over pattern consists of large hooked diamond forms containing saltire crosses. "Trees of Life" are in corners. Frieze: "Trees of Life", minor sun rosettes, and "Holy Water" (white zig-zag). 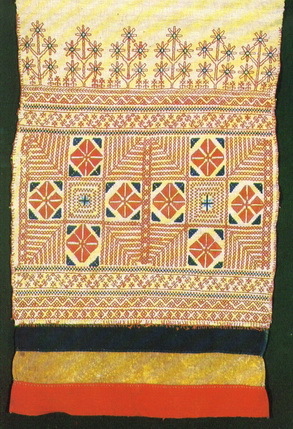 shoulder detail of a woman's dress. 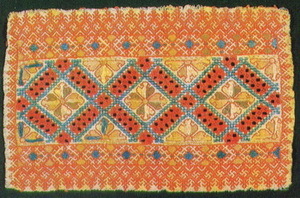 nabor (weaving stitch), satin stitch, feather stitch. The major design is of two saltire crosses forming pectinate and hooked diamonds. Frieze: swastikas and anthropomorphic figures (Rozhanicy goddesses - Ladies of Fertility). 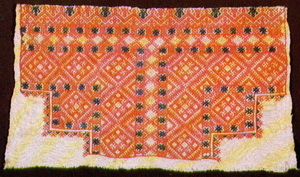 nabor (weaving stitch), feather stitch. Diamonds ("a seeded grain field") with swastikas (a symbol of the Sun) inside. The upper frieze consists of stylized figures of Rozhanicy - Ladies of Fertility, Mothers of the World. 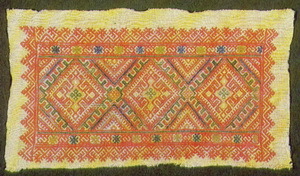 nabor (weaving stitch), "painting"-stitch, satin stitch, feather stitch. Incorporated in the major all-over pattern are squares, diamond-forms, rosette-filled octagons and sun signs. 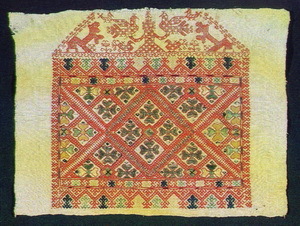 Repeat motif of anthropomorphic figures (Rozhanicy goddesses) and swastikas are seen in the border. Arranged in the frieze are two confronted peacocks on either side of a highly stylized Tree of Life. The major all-over design included a central rossete-filled octagon accompanied by boat- and cross-shaped forms, swastikas, rosettes and birds. The border is filled with swastikas and anthropomorphic figures (Rozhanicy goddesses). 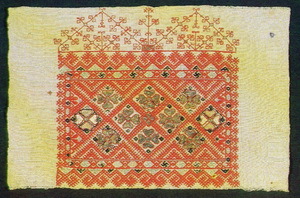 A regular net with four-petaled rosettes within each diamond is framed by anthropomorphic figures (Rozhanicy goddesses), diamonds with latch hooks and swastikas. Set in the frieze is a formalized female figure (Mother of the World) holding peacocks in their risen arms. 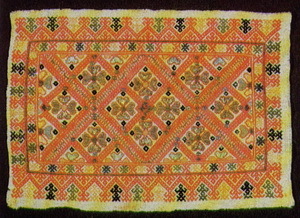 A regular diamond-shaped net containing four-petalled rosettes is the major pattern framed by swastikas and plant subjects. The frieze ornamentation is of a highly stylized Tree of Life. 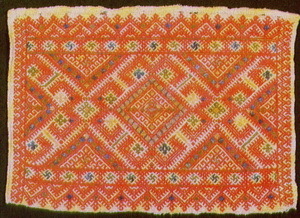 nabor (weaving stitch), "painting"-stitch, satin stitch. The ornamental panel contains various diamond-forms and anthropomorphic figures of half-height. 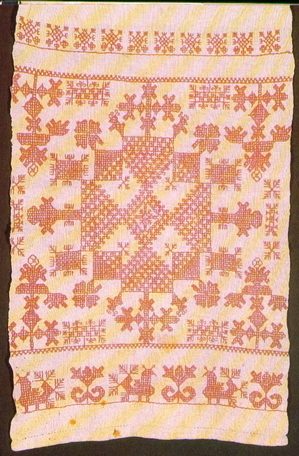 The main pattern is a regular diamond-shaped net containing four-petalled rosettes. 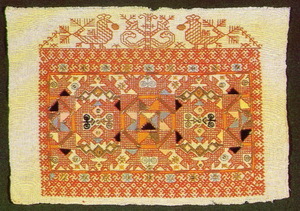 The framing ornamentation shows Rozhanicy goddesses and stylized elk's heads.